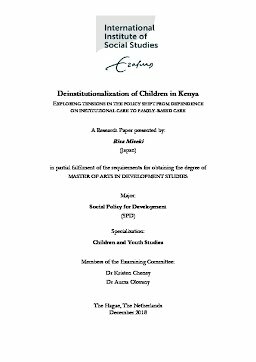 This study examines the policy shift from institutional care to family-based care, known as the ‘De-Institutionalization (DI) of children’, in the child protec-tion system in Kenya. An aim of the study is to elucidate how practitioners per-ceive DI and the Guidelines for the Alternative Family Care of Children in Kenya. A departure point of the research starts with my intervention with a boy who was integrated from a Charitable Children’s Institution (CCI) with his great-grandmother. There is literature abound on the negative impact of institutional care on children, but a discussion on improving DI progress has not been argued. While Kenya is at a critical juncture in its history of childcare, many locals are not even aware of DI. In order to achieve success in the implementation of DI, a discussion on social rupture and resilience theory is needed. While applying the system abuse perspective and drawing upon qualitative interviews with practi-tioners of DI pilot projects, this paper explores the challenges of improper allo-cation of foreign aid, limited social workforce, and lack of social support for children with special needs. This research is based mainly on primary data, which was acquired during fieldwork from July to August 2018, and my work experi-ence in a children’s office from 2014 to 2016 in Kenya.